Nothing says summer like sitting on a patio and enjoying a nice fruity cocktail, right? 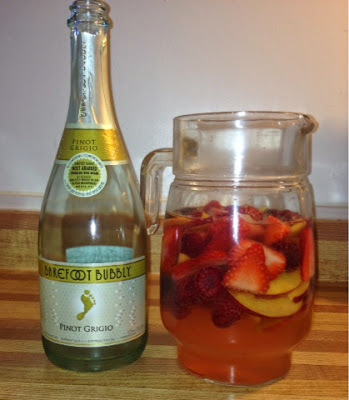 Well, I have an easy to assemble Champagne Punch recipe that is perfect for summer! Rinse the strawberries and raspberries in a colander. Set aside the raspberries and slice the strawberries. Clean the peach, and slice as thinly as possible. Squeeze the lemon juice, ensure there are no seeds in the juice. Simple syrup is, well...simple to make! All you need is 1 cup of sugar and 1 cup of water. Boil the water and sugar over medium-high heat until the sugar has dissolved, then remove from the heat. You can store the excess simple syrup in the fridge for up to 2 months. Add the strawberries, raspberries, peach slices, simple syrup and lemon juice to a large pitcher. Very slowly pour the champagne or sparkling wine over. With a wooden spoon, gently stir all ingredients together. That's it, so simple - yet so delicious! If you make this Champagne Punch, I expect an invite over!